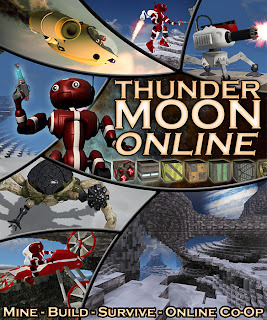 I've made all the changes I plan to make for the update to Thunder Moon Online tomorrow night. The final build has been made and I'm going through my pre-submission tests now. The goal with this update is to fix a handful of crashes people have reported and to improve network performance. While I expect to submit the update about 26 hours from now, it will take a minimum of 48 additional hours for it to reach the marketplace. It might take longer, depending on how fast my fellow XBLIG devs will peer review it. That part of the process is out of my control, unfortunately, it's just how it works on XBLIG. Here's a breakdown of the things that have changed. All reported crashes have been fixed. There were a handful of these, and they generally happened when players joined a game. I've only received a few reports of crashes, so hopefully this means it hasn't been too much of a problem. In either case, everything I know of has been fixed. Bandwidth usage has been reduced by about 50% overall. This should help a lot overall lag and with the voice chat quality. There is now motion smoothing to the characters, hover bike, and lander so these should all be less jerky in their movement. There is now a bit of glide that occurs with characters when they stop moving, but its much better than the popping that used to occur. This is a pretty common technique for networked games. Fewer pickup items, those blocks that pop out of bugs and terrain, will be physically active and moving around at once. This probably won't be noticed except when tons are being spawned while mining. Units would sometimes be vertically offset from where they should have been. This was most often noticed with the spawn portal and beacons. Sometimes, units would be re-spawned despite having been destroyed. I found one problem with this which was fixed, but I never found a way to reproduce this bug reliably so hopefully this is all that was wrong. I took care to make sure these changes wouldn't break save files and is compatible with existing data. Hopefully this will all go well and the game will be more fun as a result.